You all know I love to garden and love raising my chickens so finding a balance and what works has been very important to me for a successful chicken garden. Successful gardening with chickens was a goal I was going to reach. I was not willing to give over my small backyard to the chickens to destroy, and trust me they will if you don't take steps, but I want to allow them some free range time to eat grass which is a constant source of greens year round for them where we live. Plus, the chickens have cut the bugs in my yard and the light tilling of soil and bit of nitrogen that they leave behind has resulted in my fruit trees leaving out so healthy and lush this spring. We have one tree that has always had some slight infestation each spring but this year I swear the tree is so healthy that is seems to have fought off what usually affects it. I do not spray. Goes to show that really healthy organic soil helps plants thrive so well that they fight off a lot of pests and problems. Fencing them in was a must. You can see the post on our fencing here. I head out a little after sunrise each day to let them roam the garden four a couple of hours. They wander back into the coop to lay but this works best for me because chickens are noisy in the mornings some days with their egg songs and clucking and roaming the planters and scratching for bugs helps keep them distracted. Last year the chickens ate up my pots. This year I have planted fewer pots but those that I have put in the yard are taller. Keeping them off of low pots is important. You can see a little munching on my calendulas. I have learned to find what they will leave alone and what they will devour. By the way they love begonias. I will not plant those in the back any longer. I place a lot of pots in the planters to fill in and keep the chickens guided where I want them. Can you see the little green garden fence? I put it around the little area I wanted to plant some seeds in. So far they have managed to stay out of it. They have access to enough planters to scratch in. Putting stones or objects around the base of small plants has helped keep them from being dug up. The chickens seem to leave my shrubs alone. Not even eating them. I have been planting some more lavender to deter flies and geraniums as the chickens seem to hate them. You can see in the shot below more little green fence. In this shot I have planted pumpkin, squash and the round screen thingy in the back is potatoes. I started slips myself and just dump some compost down in there when I need to cover more of the plants. At the end of summer I will just lift the cylinder and dig for my potatoes and then spread the soil that was in there. 1. Pick up some small flexible metal garden fencing to temporarily block off areas of the garden. 2. Surround delicate plants with a piece of hardware cloth you make a cylinder of. 3. Large rocks placed around the base of small trees and shrubs will help keep the chickens from scratching at delicate roots. 4. Flexible plastic fencing can work to surround larger garden beds. Sigh. This post just does my heart good! Love those chickens and you have a lovely home for them, even if you don't give them begonias for lunch. lol The potato cylinders are a great idea! I didn't know chickens would eat annuals. The chickens sound like a fun hobby too besides egg producers. I like to see how you manage chickens in town and letting them have some time to range. During the main vegetable gardening season, we do not allow our chickens to range. But their yard is big enough to give them some space and we are always giving them treats of worms, grubs and scraps. Love what you did with your potatoes! It won't be long before mine are ready to harvest and I'm still not quite sure how to go about that. I'll figure it out. Great post! I do the same as you, cage something, plant others out of their reach. They will eat pretty much anything, but look at it this way, flowers as well as veggies are SO nutritious and good for them. p.s. SO happy to hear Richmond has legalized chickens being from Virginia! I love chickies...but am too allergic to them to clean the coop..sigh. That said, I can still live vicariously through yours. I saw the cutest veggie garden next to a coop, and it had a chicken tunnel all around the outside of the garden. Nary a bug got through that tunnel to the garden. 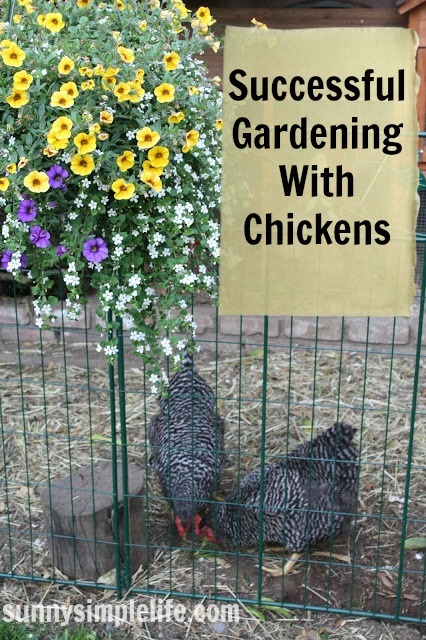 You have found the perfect fix and balance for having both chickens and a pretty yard. I am afraid I have given up the latter!!! I want to try potatoes! I have not ever grown them. I don't worry too much about the wild birds in the coop and yard. It would be a losing battle here. Thanks for your warm thoughts and prayers!!! Love seeing your pretty garden areas and how you manage the chickens and the garden in a small suburban plot. I like the potato tower. Also... the little green fence works for you? I've wanted to get some of this to keep the chickens out of certain areas--T.H. doesn't seem to think it will work. But I've seen others and now you use it! I think I am going to give it a try...our beds have such 'rustic' appearance to some it isn't attractive at all. Our chickens free range and fences in certain areas are crucial. Thanks for showing us how you do it! I love your chickens (we are getting chicks this spring!) but oh my goodness look at your garden! 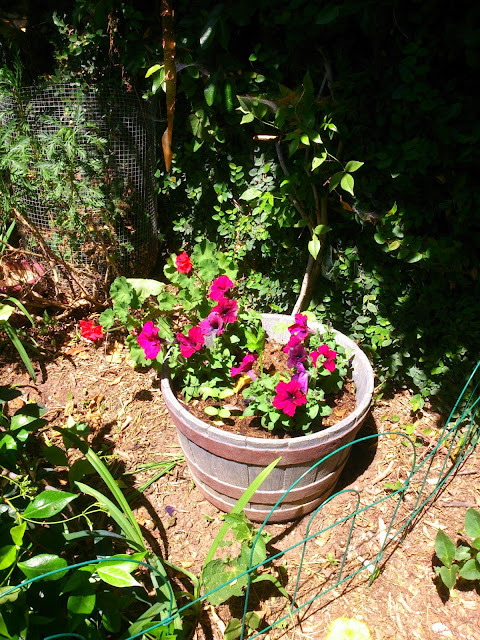 Your nasturtiums are blooming! Have you ever tried adding some of the petals and leaves to salads? They really are peppery and good. Oh Elaine, as I look out at the cold sogginess of Michigan, your garden reminds me of what is to come. I have to admit I'm a little bit jealous of your beautiful yard and garden. Your back yard is lovely!! We got chickens about a month and a half ago. They are interesting little creatures. You do a beautiful job of balancing your two loves. Wow I had no idea Chickens would even eat plants like that!.. Your flowers look so beautiful! I also didn't know that lavender deters flies. Here where i am in SC we start to have a fly problem that lasts from the day it gets warm out until almost January. They are EVERYWHERE and you can't open a door without one coming in your house. Maybe I will plant some lavender in pots to put on my deck.Maybe it will help keep them away? I also like reading about your chickens...our neighbors have quite a few...they aren't too noisy...every once in a while one ends up in our yard...I didn't know they ate flowers either! Thanks for sharing...have a great day! I enjoyed reading about the chickens and what they eat, what to grow. Fun post. I love hearing about your chickens and your garden - putting both those things together must be a challenge, but it sounds like you're learning what works and what doesn't. I think I'd love to hang out in your back yard, Elaine! I envy your chickens ~ hubby won't let me have any. I love to hear my neighbor's chickens clucking in the morning. To me it is joyful noise. These are great tips for those lucky enough to have there own coop full of hens. Hello! This is a lovely post--lots of good information for anyone thinking of letting their chickens help garden, too! I often let my hens onto my raised beds in the fall to help clean up the garden leavings and add some fertilizer for the winter! It seems fencing is a good solution! Saw your post on Farmgirl Friday and I'd love to have you share this on The Creative HomeAcre Hop! I love your chickens Elaine. Good tips on how to balance them with some pretty things in the yard. Just lost all my "girls" to coyotes, but loved reading about how you do things. I shared a link to your post today - On The Homestead! Thank you for sharing with the Clever Chicks Blog Hop this week!